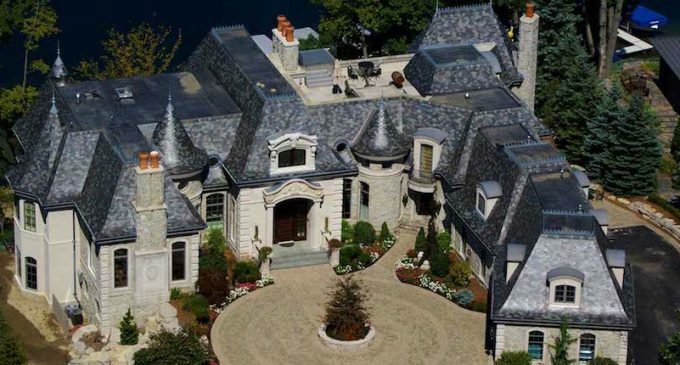 A towering lakeside manor perched 35 feet above the serene waters of Upper Straits Lake in Orchard Lake, Michigan has been reduced to $6,900,000. The 13,500 square foot stone manor was designed by acclaimed architectural firm DesRosiers Architects and was built over a period of five years. It was previously listed as much as $8,500,000 in October of 2017. There are five bedrooms and nine bathrooms throughout, an impressive main floor master suite with separate his and her bathrooms and dressing rooms as well as regal formal rooms, including a palatial formal entry with barrel ceiling and mahogany staircase, mahogany panelled library, large great room and a gourmet kitchen. Perhaps one of the home’s most unique features is a truly one-of-a-kind way to access the beach out back. DesRosiers Architects designed an elevator shaft that travels 30 feet below the lower level, providing access to a 90 foot long tunnel leading to the beach. “This tunnel allows elderly or physically challenged guests to go anywhere, including beach and boat,” DesRosiers told Michigan Blue Magazine in 2006. The tunnel is tiled, lit with sconces and offers a full bath, convenient for showering and changing after swimming. The home is designed in a French château style and finished with natural stone and slate with Indiana Buff limestone quoins, window trim and hand-carved elements. Additional features include a home theatre, bar area, landscaped terraces and garage parking for 8 to 10 vehicles. We’ve included a selection of photos released by DesRosiers Architects, you can also find the official listing photos on the Zillow listing. It’s currently on the market for $6,900,000 with Keller Williams.